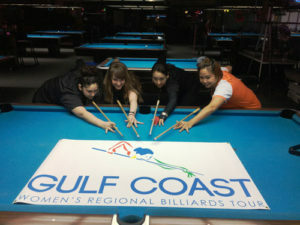 Ming Ng went undefeated at the second stop of the 2018 Gulf Coast Women’s Regional Billiards Tour season, taking down Kim Pierce in the first set of the true, double elimination final. 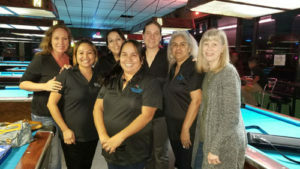 On March 17th-18th, 2018, Bogies Billiards and Sports Bar in Houston, Texas, along with Cyclop Pool Balls Cyclop Pool Balls, Ozone Billiards, APA of North Harris County, Outsville Billiards, and Vapor Knights USA, facilitated another successful event for female pool players, at the second stop on this year’s Gulf Coast Tour. Mike Fabacher with Southern Streaming produced a live, 2-day broadcast, and Houston player, Doug Schluter, provided booth commentary. A special “thank you” to Bogies Billiards for providing pizzas for the players on Saturday, a stellar wait staff, and impeccable equipment on which to compete! On Saturday, the 32-player field was whittled down to eight players for Sunday, and paid out a generous twelve places. 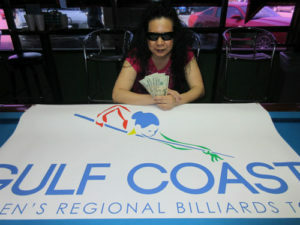 On her way to the winners’ side final four, Ming Ng bested Taniya Chuites, 7-0, Terry “The Terrorizer” Petrosino, 7-4, and Sophie Salinas, 7-2, while newcomer Sissy Lozano overcame Lisa Pinkston, 7-6, Marilina “Big M” Nieves, 7-6, and Amanda “Panda” Rikeman, 7-6. Austin’s Hopey “Hurricane” Lawrence overpowered Terri Resendez, 7-3, Celeste Espinosa, 7-5, and K.C. Mink, 7-5, while San Antonio’s Naomi Garcia ousted College Station’s Gail “Thunder” Roles, 7-6, Robyn Petrosino, 7-3, and Loretta “The Gem” Lindgren, 7-4. Following a nice run on the winners’ side, Lozano was defeated by Ng, 7-3, and Lawrence overpowered Garcia, 7-1. Ng made quick work of Lawrence, winning the hot seat match, 7-1. On the one loss side, making the cut for the final sixteen, Joyce Davis was eliminated by R. Petrosino, 5-3, and San Antonio’s Ruth Paine fell to Espinosa, 5-4. T. Petrosino took out Tiffany Mundie, 5-1, and Kim “Texas Heat” Pierce denied Natalie Rocha, 5-2. R. Petrosino went on to end Salinas, 5-2, and Espinosa bested Rikeman, 5-3, while T. Petrosino defeated Lindgren, 5-0, and K.C. Mink fell to Pierce, 5-3. After suffering a 7-6 loss at the hands of Rikeman, Pierce was on fire. With three matches under her belt, she went on to defeat T. Petrosino, 5-3, and Lozano, 5-0. Also on a streak, R. Petrosino eliminated Espinosa and Garcia by the same score, 5-1, racking up five match wins. Pierce ended Petrosino’s run, 5-2, and plowed through Lawrence, 5-2, to meet Ng in the finals. It was a short-lived final for Pierce, as Ng took control, ending the first set, 7-0. Congratulations to Ng on her first victory of 2018! In other news, San Antonio’s Marilina “Big M” Nieves wins her very first, second chance tournament, and Houston’s Amanda “Panda” Rikeman finishes runner-up. Congratulations to these two ladies on a well-played, competition! The Tour would like to recognize Sissy “Urban Cowgirl” Lozano on her 5th place finish, her highest to date! It was a great weekend of fellowship for the women of the Gulf Coast Tour. Congrats to all the winners and a big “thank you” to everyone who came out to play! Players were pumped up this past weekend about the new changes on the Gulf Coast Tour. Players can now enjoy a new, relaxed dress code, free mini pool clinics, and second chance tournaments on Sunday. At this event, the Tour announced its new Gulf Coast Tour Committee, made up of nine women, committed to promoting Tour visibility and growth. One of the committee’s goals for 2019 is to organize a $10,000 added event for Gulf Coast Tour players. This past weekend, Gulf Coast Committee Members Gail Roles, Celeste Espinosa, and Ruth Paine worked tirelessly to keep the event running smoothly. Match play ended around 8pm on Saturday, and 6pm on Sunday. 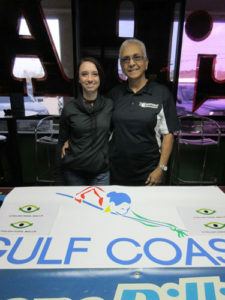 Gulf Coast Committee Members are as follows: Brooke Dailing, Celeste Espinosa, Toni Esteves, Kim Newsome, D’Andrea McQuirter, Ming Ng, Ruth Paine, Kim Pierce, and Gail Roles. Change is in the air! Last but not least, congratulations to John Linton who won a brand new set of Cyclop Pool Balls, and Brooke Dailing who won a Poison VX Break Jump Cue in the weekend raffles! The next event will be held June 2nd-3rd, 2018, at Fat Racks Sports Bar and Billiards, located at 11807 West Avenue, in San Antonio, Texas. This event will be $1,000 added, two days, and played on 8’ tables.